I have renovated and remodeled three homes and I treated each as both an art project and business venture. I gave tired bones new skin – I gutted & rebuilt kitchens, reconfigured layouts, uncovered original hardwood floors and threaded new wires through walls. I gave everything new colors. Working with my own two hands with hard media like wood, drywall, and tile inspired a lot of the flat drawing/painting work I'm making now. I saw mass and texture in new ways and understood surfaces as the result of many built-up layers and lines below. I redrew the kitchen layout to open up sight lines and maximize space by moving the refrigerator into an old pantry and opening up a breakfast bar through to the dining room. I kept and restored the original stick-built cabinets and used round shapes – penny-sized backsplash tiles and really interesting river-bottom-layer countertops with cross sections of stone – to visually soften the small square space. I added bead board around the bar but it looks original to the style of the home. Through the rest of the house, I ripped out carpet and restored original wood floors (including beautiful tiger-stripe pine in the bedrooms) while painting walls modern grey and yellows. This project consumed every weekend and many late weeknights for 10 months (much of the work was done alone) and I became very close friends with the house. By the end, I'd peered or reached into almost every wall cavity, crawled through every nook in the attic, and fed wires through every basement rafter. This condo unit hadn't changed decor in about 50 years – mustard shaggy carpet, cream and brown color scheme, and a dark galley kitchen. I recreated the entire space but focused on the kitchen by opening up the galley wall for a look-through and rearranging counter space. 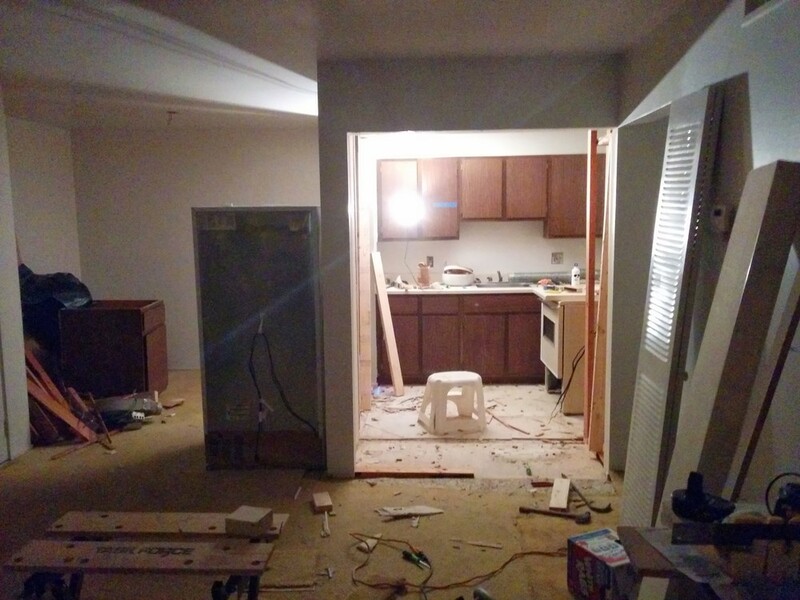 Everything was replaced: cabinets, appliances, sink, backsplash, and granite countertops. Subway tiles set vertically emphasize the tall ceilings. An sold-wood door salvaged from a recycle yard frames the look-through and forms a shelf for jars and bottles above the refrigerator. I added chair rail to define the dining area as separate from the living room; the bathroom was mostly gutted and replaced with new subflooring and ceramic tile and new vanity/sink/fixtures.